Mackenzy Cord had one goal he had striven for during the past several years. Bounty after bounty, he had saved his money, earned a good reputation, and shortly hoped to accept a safer job that would also keep him close to home. All of this hinged on one woman, Savannah Carrington, his best friend. The woman that he loved. Then he learns that she not only was engaged, but had run away. Mac follows her to New York. Unfortunately, Sav had inadvertently been involved in a bank robbery, and was now a suspect. Determined to bring her back to South Carolina safely, and properly deflect suspicion off Sav, Mac poses as her husband. Savannah couldn't believe what had happened to her. She had been duped, robbed, and now her best friend was acting quite unusual. Unfortunately, his behavior was triggering emotions and actions Savannah couldn't quite explain. Mac was her best friend, but that was all. There was no way he'd appreciate anything more. 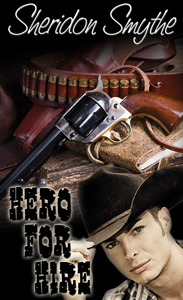 Hero For Hire is a perfect example of why I love best friends romances and a hero who is oh-so-in-love with his heroine. I adored Mac. He is trying so hard to put himself in a position he considers "worthy" of Sav. At the same time, Savannah is starting to discover Mac the man, as opposed to just Mac the best friend. This was an entertaining read, and I would be interested in reading more stories by the writing team of Sheridon Smythe.